Madagascar is a 2005 successful computer-animated adventure comedy film, produced by DreamWorks Animation. It has a couple of sequels, and a spin-off featuring the penguins. The simple plot is that four animals raised in a New York zoo venture out into the wilds of Madagascar. They will have to survive in the wilderness, and along the way learn more about themselves. They will quickly realize how easy they had it back home in the zoo. The main thing about Madagascar is that all the characters, including the supporting ones, are likable and funny in their own way. Every one is quite different. 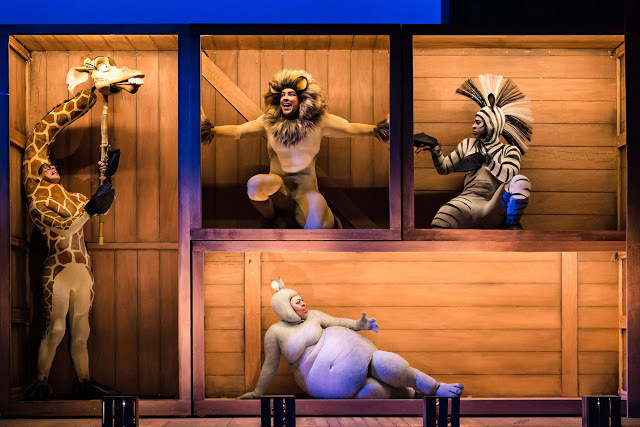 X Factor 2016 winner Matt Terry, who plays Alex the Lion, is perfect in his theatrical debut. His voice is pure and his falsetto, beautiful. Timmika Ramsay is an excellent Gloria. Antoine Murray-Straughan as the zebra is fantastic with his rap and his jokes. Jamie Lee-Morgan is, finally, the funny hypochondriac giraffe. There are quite a few humorous scenes in Madagascar, not necessarily targeted to children. One of my favourite has to be the "distinguished" chimps who get offended that the thought of looking or smelling like a monkey is bad; another one is the joke about the rectal thermometer. An honourable mention goes to the penguins who also got more than they bargained for in Antarctica. Fabian Aloise's great choreography is highly entertaining and Tom Roger's costumes are original, although I can’t imagine how the actors can dance and sing in this heat (considering that the theatre had the same temperature of a sauna). Tom Rogers's design is innovative and colourful – a pleasure to watch. Madagascar the Musical provides a lot of enjoyment. It is great for getting the kids out of the house and good if adults want to get away and enjoy something more suitable for the family. Madagascar is at the New Wimbledon Theatre until 28 July before the UK tour.